This Saturday sees The Dons return to Pittodrie to face Kilmarnock in a mouth-watering league clash. With only two points separating the sides and only two separating the visitors from top of the table Celtic, it’s finely poised with the league now back up and running for the second half. The Dons go into this one having collected three important points in midweek at Hamilton with Sam Cosgrove back amongst the goals. Lewis Ferguson scored the third against his old team as the visitors ran out comfortable winners. Kilmarnock continued where they left off at the end of 2018 with an excellent comeback against Rangers at Rugby Park. They went behind early, but claimed the points thanks to goals from Eamonn Brophy and Rangers-bound Jordan Jones. The win lifted Killie to second spot, leaving Aberdeen and Rangers two back on 42. “They are very structured and an organised team. Everyone knows their roles and they have a very competitive element to their squad. They pull off some fantastic results and that has got them to where they are in the league. We’ve got a challenge tomorrow and we all recognise it. You know the teams who are working Monday to Friday and have a good structure so it will be a tough game for us. It’s a good game for us and it’s important we try take the opportunity that’s in front of us. “I don’t want a rest and I don’t need one. I’m a young boy so I can play as many games as I want just now. You could maybe say that about an older player and it might have an effect on their body, but I’m still young and enjoying it at the minute and I want to keep doing that. It’s been a remarkable 14 months thus far for Kilmarnock under the stewardship of Steve Clarke. The Ayrshire side went from relegation candidates to claiming the most amount of points in the league from the 2018 calendar year. Few could have predicted their rise and the win in midweek reinforces the idea that Killie are in it for the long haul. Now sitting in second spot three points against The Dons would add fuel to their title challenge. This is the third match between the sides this season and it’s one a piece so far. The meeting in September was marred by controversy as Michael Devlin saw read with only five minutes on the clock for pulling back Eamonn Brophy 40 yards from goal. Despite the protests, the defender was giving his marching orders and The Dons were up against it. An excellent free kick from Brophy just before the break put Killie ahead. Despite the pressure in the second half the game was won by a certain Greg Stewart. He picked the ball up after a Dons attack and drove towards goal, skipping by two or three Aberdeen players before dinking Joe Lewis from outside the box to wrap up the points. Thankfully Greg will be in red this time around. The return fixture at Rugby Park in November was a tight affair. A poor first half display had The Dons behind courtesy of a Kris Boyd penalty. As the game dragged on Derek McInnes sent on Bruce Anderson and the youngster did his job by directing a shot from McGinn into the bottom corner and Aberdeen were level. With the clock ticking down there didn’t look like there’d be a winner, but Lewis Ferguson, fresh off his Hampden heroics a week earlier fired home a free kick in the dying embers of the match to give the visitors a huge three points. The league’s form player. After only netting twice for The Dons in 20 games, the big striker’s remarkable December form has propelled him to the top of the goal scoring charts. His double at Hamilton in midweek means he sits on eleven for the season, one off Alfredo Morelos. He has been a talisman for helping Aberdeen earn some big points and will be a big player on Saturday. He only left Killie at the start of the month, but Stewart will line up against his former teammates this Saturday after rejoining The Dons on loan from Birmingham. The attacker scored eight goals for Killie including the winner against Aberdeen in September and has already put in two solid performances on his return to Pittodrie. The middle of the park may prove crucial to which way the game goes and The Dons will require their captain to be a big presence. Shinnie was excellent against Hamilton and there’s plenty of firepower in the Killie midfield to make it an intriguing battle. Killie’s talisman for most of the season, the former Hamilton Accies man has bagged nine goals so far this season including the opener when the teams met in September. A quick player who makes life difficult for opponents in the final third and scored the equaliser against Rangers in midweek. A strong man in the middle of the park for Killie, the Irishman has the skill and awareness to find a pass and won’t be one for pulling out of challenges. Shinnie V Power will make for some good viewing. The pacey winger has had some decent games against The Dons in his time and the visitors will be looking to him to cause problems again although he did see red in this fixture at league match at Rugby Park last season. Despite agreeing to a pre-contract at Ibrox, the 24 year old grabbed the headlines on Wednesday when he fired home the winner against his future employers. If you can’t make the game tomorrow UK listeners can tune in from 2.45pm for coverage with Dean Campbell on the commentary alongside Dave and Andrew. International subscribers can watch live and post match we will have reaction, goals, highlights and a full match replay. Enjoy the game and come on you reds! Defence beat attack on this occasion as both sides worked hard to deny their opponent’s. Aberdeen enjoyed numerical superiority for the last ten minutes after Kris Boyd received a straight red card but they were unable to capitalise. 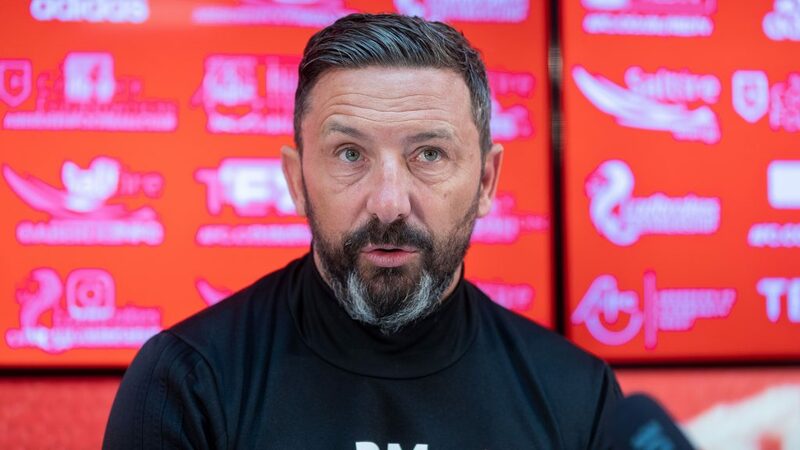 After victory on Wednesday night over Hamilton Accies Derek McInnes named the same starting line-up for the visit of high-flying Kilmarnock. 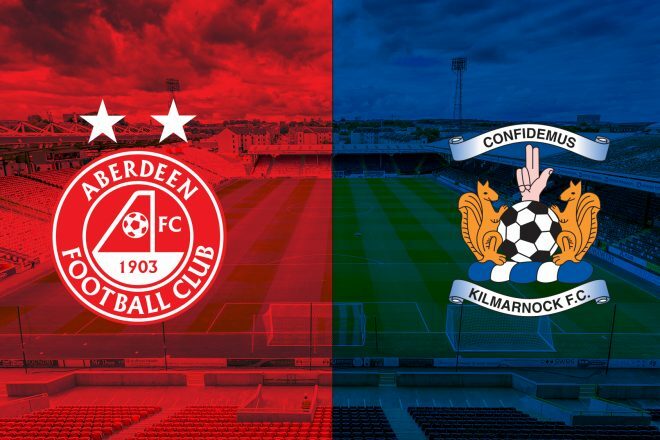 The match was a ‘six-pointer’ with both sides tightly grouped in the top four of the league table, a win for The Dons would see them leapfrog Killie into second position. Steve Clarke also made no changes to his starting line-up, naming the same side that defeated Rangers in midweek. The opening ten minutes of the match passed without any goalmouth action with most of the play taking place in the middle of the park. Despite the lack of action, it was a keenly contested start to the match and it was evident that both sides would have to battle to gain the space required to create chances. The first corner of the match was awarded in the 20th minute when a cross from Stewart was deflected behind. The delivery was partially cleared before Cosgrove volleyed over from just inside the area. It was a difficult one to take but a sign of the striker’s confidence to take the shot on. Just before the half hour mark Graeme Shinnie went into the referee’s book for a late challenge on Tshibola which broke up a potential counter-attack for the visitors. Aberdeen had their second opportunity to deliver from a corner but it was Kilmarnock who ended up on the front foot with O’Donnell breaking on the counter-attack, Logan got across to stop the attack and was harshly penalised. From the free-kick the ball was headed well wide of the goal by Brophy. 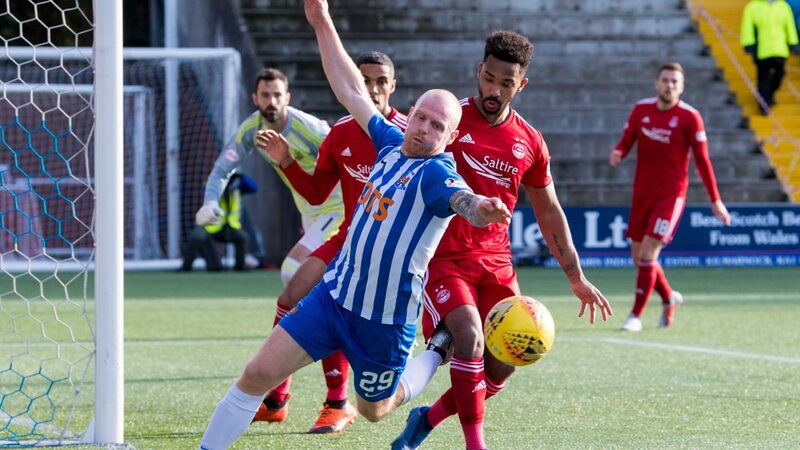 In the 39th minute Aberdeen broke through the Kilmarnock midfield for the first time in the match with Lowe beating his man on the left before finding May in space 30 yards from goal. The striker hit a powerful strike which looked set for the top corner, but Bachmann was alert and produced a great save to tip the ball wide. All eyes appeared to be on Greg Stewart in the build-up to the match and he got his first shot away a couple of minutes before the break but would have been disappointed not to stretch Bachmann a bit more. As the half-time whistle sounded Lewis Ferguson picked up a yellow card for dissent after Stuart Findlay hit the ground under a challenge. At the break it was all to play for. The Dons started the second half strongly and it wasn’t long before Stewart posed a threat once again. On this occasion he picked the ball up on the right and curled the ball just wide of the far post from 20 yards out. The hosts were starting to ask a lot more questions of Kilmarnock, knocking the ball around well on the pitch which was playing a lot quicker thanks to the rain which had been coming down for most of the match. In the 57th minute Cosgrove was bearing down on the back four before being brought down by Dicker. The challenge resulted in a yellow card for the Kilmarnock captain. Just before the hour mark the visitors made their first change as Brophy was replaced by Kris Boyd. Five minutes later, a second change for Kilmarnock as McKenzie replaced Burke. Despite the change in personnel the game plan looked to remain the same for Steve Clarke’s side as they looked to soak up pressure. Those changes were followed by Aberdeen’s first substitution of the match as McGinn replaced May. With twenty minutes remaining Mackay-Steven clipped a cross into the box which was headed clear by Findlay. Ferguson picked the ball up 25 yards from goal and opened up for a shot which ended up the wrong side of the crossbar with both teams finding shooting opportunities hard to come by. Tshibola joined Dicker in the referee’s book after picking up a yellow card for dissent as the atmosphere in the stadium ramped up with both sets of supporters looking to spur their side on to find a winner. The game was opening up a bit which offered Kilmarnock an opportunity to break once again, Power played Taylor through and his cut back eluded the blue and white shirts in the area. From there Aberdeen broke up the park and Scott Boyd picked up a yellow card for a cynical foul on Stewart. In the 77th minute, another yellow card as Power joined his teammates in the book for a late challenge on Ferguson where he never really looked like winning the ball. With twelve minutes remaining Aberdeen were forced into a change when McKenna picked up a knock and hobbled off the pitch. He was replaced by Tommie Hoban who was making his return to action after a long injury lay-off. Kilmarnock subsequently made their final change with Jones being replaced by Ndjoli. It was a very stop-start spell in the match as both teams struggled to find their rhythm. 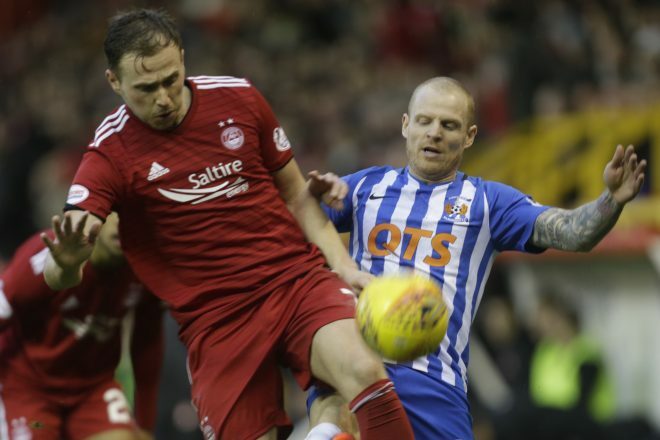 As the match looked to be drawing to a close The Dons were handed a boost as Kilmarnock were reduced to ten men after Kris Boyd caught Shinnie with a dangerous lunge. The referee took his time to consult with his colleagues before producing the red card and all of a sudden there was a real opportunity for Aberdeen. In the 86th minute there was a penalty shout for The Dons as Hoban found McGinn on the edge of the area, he rolled Scott Boyd with his first touch and went down as he entered the box, but the referee waved play-on. With a couple of minutes remaining The Dons took their last roll of the dice as Wilson replaced Mackay-Steven. McGinn had an opportunity to deliver from a corner in the 90th minute and unfortunately Power was there to clear Stewart’s header as it looked to be goal bound. The Dons now had four minutes of added time to get the winner. 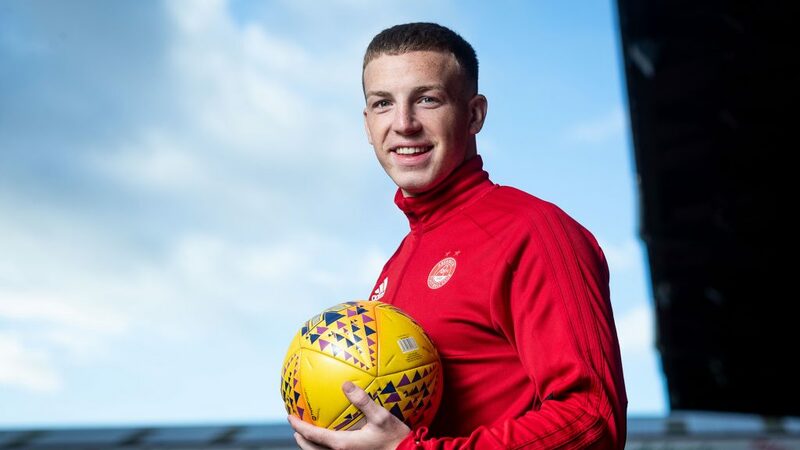 Cosgrove burst into the area but was denied by Findlay just as he looked set to pull the trigger and there was a real sense of frustration for Aberdeen as it looked unlikely that a better opportunity would come. There was one more shot as Wilson saw his effort deflected into the path of Bachmann and it was a straightforward save for the keeper. Ultimately the match ended goalless and the point lifted Aberdeen above Rangers into third place.